For many years, I had mixed feelings about the rainbow flag, whose creator, Gilbert Baker, died on Friday. Growing up in the 1980s as a closeted bisexual, I chose, if only half-consciously, to align myself with other identities that allowed me to avoid any allegiance to a scorned minority group, of which I had mostly negative images. The rainbow seemed cheesy as an LGBTQ symbol, conveying in my mind a forced, overly sentimental vision of diversity then being celebrated in my progressive high school. The rainbow, of course, has significance well beyond queer liberation. It appears in nature as the sign of a storm’s end. In the Bible, God tells Noah after the flood that the rainbow marks his promise to protect life on earth from destruction in the future. It was since used by pacifists to symbolize peace, by hippies to represent love, and by Jesse Jackson in the name of his civil rights organization, the Rainbow Coalition. Since that 1939 world debut, millions upon millions of queer kids have identified with Dorothy’s yearning to close her eyes and wake up somewhere “far, far away, behind the moon, beyond the rain,” a place where “troubles melt like lemon drops.” So have non-queer kids, of course, and adults for that matter—anyone who ever felt a gulf between their needs or aspirations and their capacity to meet or attain them. But to those of us who spent a youth terrified that we had no earthly future worth reaching, little could compare to the flight of imagination: What could more surely make this inner storm end but a celestial place where dreams replaced troubles and happy little bluebirds flew free? Like Dorothy, Gilbert Baker was from Kansas. Unlike Dorothy, Baker eventually landed in San Francisco in 1972, where he encountered and helped advance a burgeoning queer liberation movement. The country’s bicentennial celebration in 1976 made American flags suddenly ubiquitous, and Baker, who threw himself into the hive of activism centered on Castro Street, began to think that LGBTQ people needed a flag of their own. “A flag fit us as a symbol,” he realized one day. “We are a people, a tribe if you will. And flags are about proclaiming power.” When the gay San Francisco political pioneer, Harvey Milk, sought an iconic image for a 1978 march he was organizing just months before his assassination, he turned to Baker, known as a crackerjack “seamstress.” (Baker’s grandmother owned a women’s clothing store that had always enthralled the boy, and learning to sew was a dream he achieved only after leaving Kansas for the Castro.) Baker dyed and stitched the first official gay pride rainbow flag with help from more than two dozen other activists in the attic of the city’s Gay Community Center. He was right. And it changed millions of others as well. 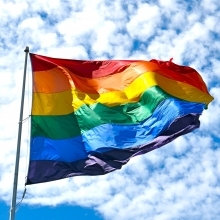 Over time, the rainbow flag has become a beacon to LGBTQ people worldwide. New York’s Museum of Modern Art recognized its importance by adding the flag to its design collectionin 2015. As a colorful symbol literally appearing in nature, it lent credence to the affirming notion that sexual minorities were naturally occurring, beautiful variations on a theme, rather than sinful, sick or criminal deviations from the only acceptable norm. It built on the early history of queer life by echoing the brightly colored displays that gays and lesbians used to pin on lapels or tuck into pockets to signal the shape of their hearts. It expressed solidarity with the anti-war and civil rights movements that helped launch queer liberation. It paid homage to Oz. After a period of inner evolution, I suppose the rainbow grew on me just as it was designed to—from a mostly unconscious symbol of hopeful escape to one of pride, liberation and, eventually, belonging. When the publisher of my first book, about gays and lesbians in the military, showed me the jacket design, I initially balked at the image of a military ribbon front and center—decked out in rainbow colors. I worried, or so I said, that closeted soldiers might be discouraged from reading it due to the revealing imagery. Assured it was adapted from an actual military ribbon, I relented, and grew to love the cover. On the front of my latest book, about the battle for marriage equality, the rainbow flag is hoisted above the Supreme Court building, cutting through a cloud-white sky, as if piercing a storm. Or maybe it’s a storm’s end? To me, now, it seems perfect.